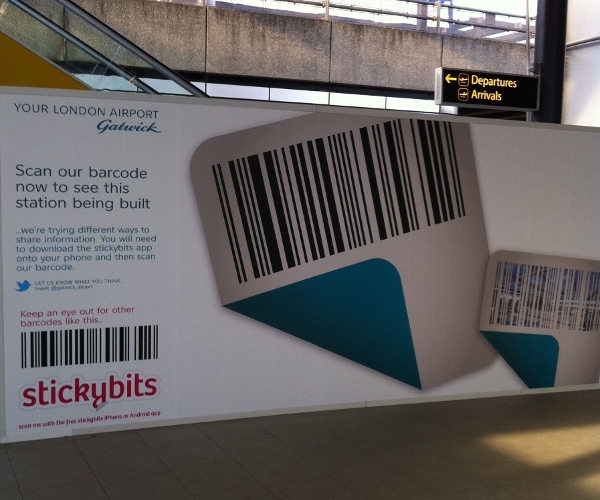 Giant barcodes at UK airport to lead visitors on "Discovery Tour"
Not content with its Twitter screens, London’s Gatwick Airport is set to lead visitors on a “Discovery Tour” thanks to giant barcodes currently being rolled out. The first of these, pictured here, was launched yesterday at the airport’s North Terminal Shuttle Interchange. When passers-by scan the barcode with their mobile phone they are taken to a short video showing how the shuttle line between the two terminals was built. More barcodes will be introduced over time, forming a “Discovery Tour” designed to promote the the airport’s investment programme. The tour has been created by communications agency Rabbit and is the first time the services of “Internet of Things” startup Stickybits have been used in the UK. Stickybits allows photos, videos, text, PDFs and the like to be attached to barcodes, adding an online multimedia element to any real-world object. Users simply have to install the Stickbits iPhone or Android app and get scanning. Read next: Skype For Mac Beta 5 Is Out. Group Video Calling & More.